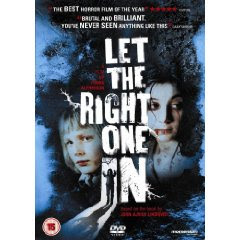 Damon Lord: Advent calendar 2013: day 7 "Let the Right One In"
Advent calendar 2013: day 7 "Let the Right One In"
Today we turn to cinema to enjoy Let the Right One In. In the original Swedish it's called Låt den rätte komma in. It's a gentle tale focusing on the relationship between Oskar, 12 years old, and Eli, who moves in next door and appears to be about the same age but is actually centuries old, as she's a vampire. Oskar is bullied by his fellow school pupils, and as Eli tries to feed in the 1980s suburbs of Stockholm, they helps each other overcome their problems. There are some differences between the original book by John Ajvide Lindqvist and the film (also scripted by Lindqvist), but their loss from the movie does not detract.